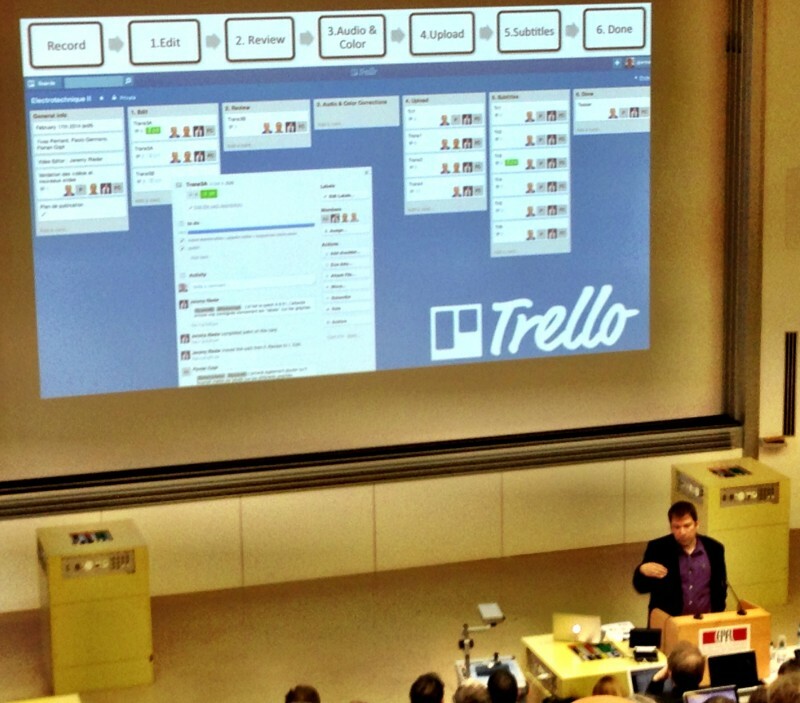 As little as a year ago, I was getting started curating the first German cMOOC at Leuphana Digital School. 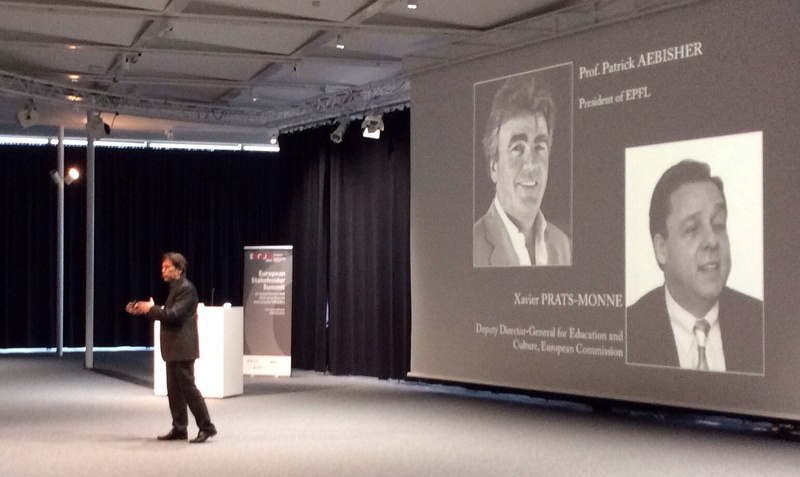 With the second eMOOCs conference, the Centre for Digital Education at EPFL is firmly establishing itself as a European driving force to move the debate over educational technology in academia from niche to mainstream. Pierre Dillenbourg has gathered an impressive turn-out of important scholars, political decision-makers and influential stakeholders – along with enthusiastic practitioners and field researchers for these three days. 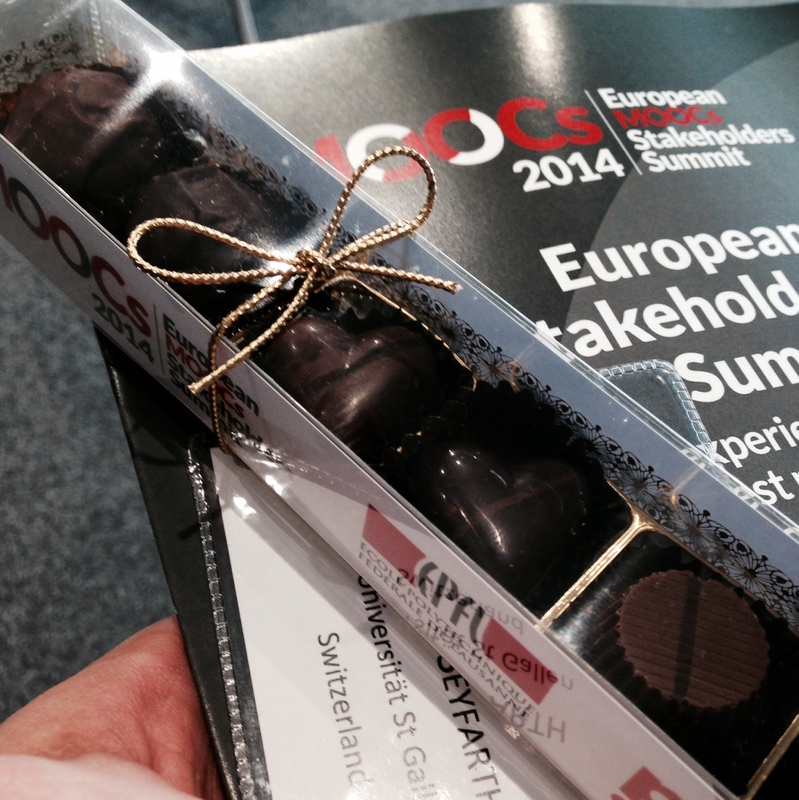 Sweet idea: The conference package includes hand-crafted Swiss chocolate treats, yum. Less prominently, but no less pleasant was the unexpected reunion of several GO-GN fellows in the Rolex Learning Center of Lausanne this morning: UNESCO-Chair Fred Mulder is part of the program commission, of course, Bernard Nkuyubwatsi is presenting a paper on cultural translation, Marta Cáceres Piñuel is attending as part of a large CSEV delegation from Spain. My native Germany is institutionally under-represented, especially in the policy track, and for some reason there is a sizeable Norwegian delegation – a statistical outlier or is there something more going on? It couldn’t have been all due to the Swiss truffles included in the conference package. Pierre Dillenbourg displayed a wicked sense of humour, pumping “Brazil” through the speakers before his opening remarks. Or he never sat through the director’s cut of Terry Gilliam’s movie. Indeed, unbridled MOOC enthusiasm in the opening keynote got the room excited. Six months have passed since the first European MOOC summit took place here – that is a small eternity in the current excitement over educational technology. On the one hand, some early enthusiasts have been back-pedalling recently. On the other, the rising wave of adoption is barely reaching the mainstream in many European countries. 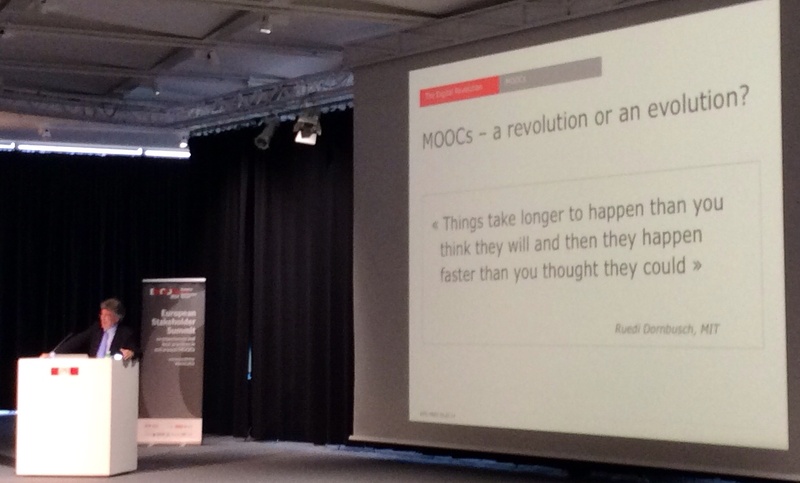 It was clear during Aebisher’s review of the past year’s MOOC experience here, however, that EPFL intends to be at the forefront of what it sees as an impending revolution, with a clear commitment to the long haul. This includes a strong focus on Africa, where EPFL has a distinct advantage, being able to offer highly reputable content in French. What backlash? Europe’s measured approach to educational technology doesn’t faze Patrick Aebischer: No matter what happens in the Silicon Valley, they will never beat EPFL at French. The conference attempts to structure a fluid, multi-facetted debate into four broad tracks, with many speakers appearing in more than one: policy, research, experience and business (models). This may serve as an indicator of how all-encompassing this rapidly developing topic is for institutions, policy-makers, practitioners and students in European higher education. Sessions include hands-on video production tips and intricate legal issues of certification as well as panel discussions on mutli-stage governance mechanisms for national and EU policies on open online education. It was baffling to enter an early-morning pre-conference session, to find a lecture hall packed and 150 mid-career academics listening in rapt attention to the do’s and don’ts of setting up a studio and organzing smooth production processes vor educational video. Much time is expressly devoted to data-driven, quantitative analytics of xMOOC and similar formats, which only loosely coincides with my own research and teaching interests. It is encouraging to see, nonetheless, how a niche idea few people had heard about as recently as twelve months ago is gaining so many legs – academic, administrative, legal and otherwise – this side of the Atlantic and with a strong focus on development/education in the Global South.